With a stay at hotel BLUE in Myrtle Beach (South Myrtle Beach), you'll be minutes from Family Kingdom Amusement Park and close to SkyWheel Myrtle Beach. This beach hotel is close to The Market Common and Broadway at the Beach. Make yourself at home in one of the 224 air-conditioned rooms featuring refrigerators and flat-screen televisions. Rooms have private balconies. Wireless Internet access (surcharge) keeps you connected, and cable programming is available for your entertainment. Private bathrooms with shower/tub combinations feature complimentary toiletries and hair dryers. Dip into one of the 2 spa tubs or enjoy other recreational amenities including a lazy river and a fitness center. Additional features at this hotel include complimentary wireless Internet access and tour/ticket assistance. Enjoy a meal at Cafe BLUE or snacks in the hotel's coffee shop/café. Relax with a refreshing drink from the poolside bar or one of the 2 bars/lounges. Buffet breakfasts are available daily from 7 AM to 11 AM for a fee. 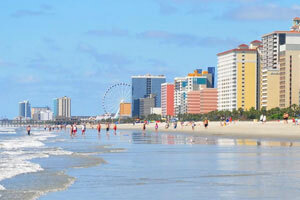 The preferred airport for hotel BLUE is Myrtle Beach, SC (MYR). All single adults and children under 21 must be accompanied by a parent or legal guardian.